There are lots of easy ways to cook and eat fish fillets. Simple recipes include frying, baking, barbecuing, battering and crumbing. There's nothing better than a simple fillet of fish baked in a lemon butter sauce. Serve with a side of rice or pasta and a crisp green salad. 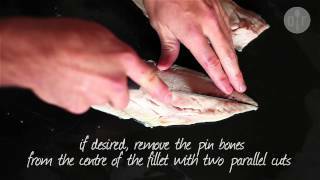 This is a simple yet great way to cook fish you have caught yourself or bought. It gives the instructions on how to crumb and fry the fish. Serve with chips and salad. This is an easy grilled fish fillet dish that is finished with a parmesan blend being melted onto the top that contains chilli sauce and mayonnaise.